It's quilted. My RSC block for January is actually 30" square. I'm donating it to the NICU ward at our county hospital. I bound it with the blue in the center. It's already given to the charity coordinator of our guild. 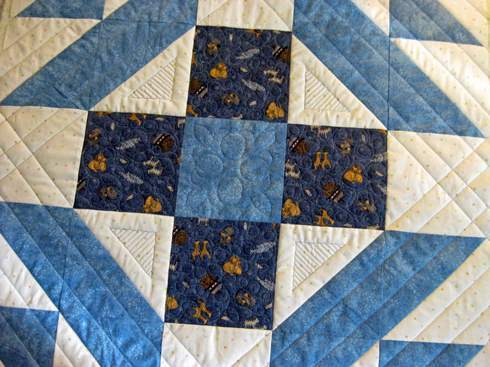 Alas, I forgot to take a photo of the bound and finished quilt. 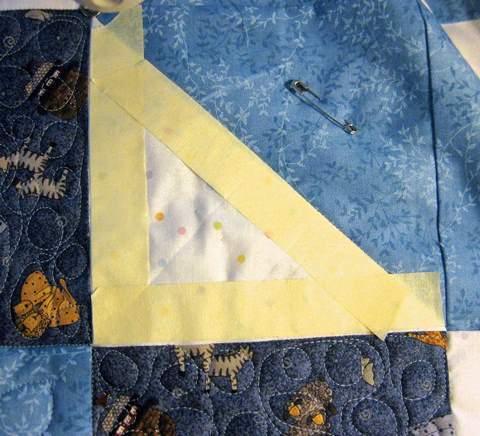 For this preemie quilt I did freezer paper work, tape work, FMQ, used a walking foot, and a Hera marker. The thread was a blue So Fine #50 by Superior Threads. This is my alternate to ruler work at times. 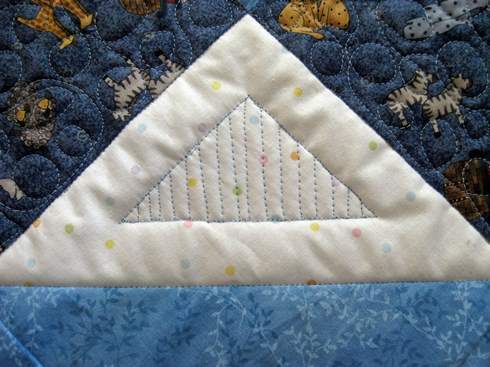 With my FMQ foot I stitched a triangle. 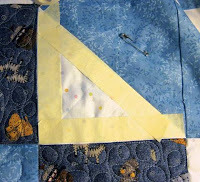 Then did straight lines inside the triangle - again with my FMQ foot. I drew one straight line with the Hera marker to keep me aligned. You can see it in the photo with tape. Well, they're straighter than they would have been - lol. Go here to see the posts where Karen of Faeries and Fibres showed us how to do these. I used the Hera marker to draw the lines on the white squares. I found that when trying to follow a Hera line one has to look ahead of the foot to see the line. 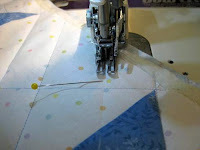 I'm linking to Finish it Up Friday, Let's Make Baby Quilts, Finished or Not Fridays, Free Motion Mavericks, Can I get a Whoop, Whoop? and Scrap Happy Saturday. Enjoy them - I sure do. Last week's winner of the fat quarter was Chris in Canada. Congrats, Chris. I'll be sending you an email. This week it's another fat quarter for a linker or commentator. Link party button below. Would love to see or read about what you are working on. Ends midnight, Thursday. I'm going to try using a knitting needle to mark some quilting lines and see how it works. Thanks for the tip! Hello Angie, It's turned out beautiful. Thank you for linking up with Free Motion Mavericks - your quilt is this week's featured project!